Without a doubt the best handset that Oppo has ever made. It’s also a brilliant mid-range phone that simultaneously troubles Apple and Google’s flagship phones on value. Once upon a time, phablet versions of phones were simply larger than their regular-sized counterparts. Take phone, make bigger, sell. Now, though, pick up an Android with a screen larger than 5.9”, and you’re in for a treat. The extra room in the chassis offers manufacturers the chance to bolster the screen resolution, increase the battery capacity, and improve the camera’s capability. While much of what we said in our R9s review stands true here, Oppo has improved upon that brilliant performer in a few ways, ticking two of those boxes, though the company’s philosophy of ‘bigger equals better’ sometimes comes back to bite it. As you’ll see, though, for this is phablet that punches well above its weight in the mid-range price bracket. The Oppo R9s Plus retails at AU$698 compared to the AU$599 for the R9s. For this additional AU$99, the result is a mid-range beauty that impresses with its feature set, and also demonstrating that the Chinese company knows how to make a handsome unit, despite a few niggles with the interface. 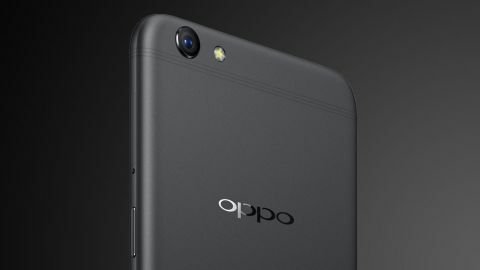 Mid-range it may be, Oppo clearly has its eye on the phablet everyone else wants to best: the Apple iPhone 7. And it has the bullet point stats to do it: Oppo’s R9s Plus is taller, wider and yet thinner and lighter than Apple’s largest offering to date. At first glance the Oppo R9s Plus looks like it’s bursting out of its frame, thanks to the screen taking up 72% of the front of the unit. Crucially, it looks like it takes up more than that, even giving Samsung’s Galaxy S8 a run for its money. Like its smaller sibling, the phone is quite slippery despite the extra 0.7mm depth and slight gradient from the middle of the frame to the screen. Again, Oppo includes a basic silicone case with the phone, and the company has already installed a screen protector in case it does tumble out of your hand and onto the bathroom floor. A capacitive touch button sits dead centre under the screen, and it’s wedged almost at the very end of the bottom of the frame. This button is blazingly fast, like the regular R9s, and will both wake the phone up and send you to the last active app or open screen. However, getting your thumb on it one-handed can be tricky at first. Because of the dimensions of the phone, those with Trumpian digits may find it see-sawing out of their grip. Oppo has aped the Samsung layout, with the back button sitting to the right of the home key, and the recents to the left. This gives that screen full, glorious use of the real estate on offer. The power key sits on the right-hand edge about a third of the way from the top, and the volume buttons directly opposite on the left-hand side. For the Donalds of this world it can be a bit of a stretch to swing your thumb from the home key up to the power or volume. The dual SIM tray on the right allows for two nano-SIM cards, or one SIM card and a microSD card. Go for the latter option and you can bolster the R9s Plus’ 64GB onboard storage up to 256GB. Like the R9s, a speaker grille, a micro USB port and 3.5mm headphone jack are placed along the bottom edge of the frame. Imperceptible antenna lines run horizontally across the rear of the R9s Plus, laid out in two sets of three. They’re very fine, and sit well outside of the perimeter of your palm. If there’s one thing we do wish the R9s Plus had, it’s NFC. Android Pay is a total no-go here.